MORE Services is a C.A.R. CERTIFIED TRANSACTION COORDINATOR. Enter MORE Services: We are ready to handle your transaction coordinator needs; saving you time and money couldn’t be easier. Let us chase the paper so you can focus on your clients; while you go out and sell! No matter how many deals you close a month; if you are spending time focusing on activities that don’t have the potential to produce a sale, then you are losing time and money needlessly. For example, you can spend 20+ hours on pending transactions scheduling appointments, chasing down signatures, copying, faxing, emailing’ etc.. Or you can outsource your file management for that transaction & use that 20+ hours to prospect for more business and give your clients additional time. This is going to give you a better opportunity to make a sale? – To deliver the highest level of customer service while assisting our clients. – To maintain and deliver A complete transaction file. 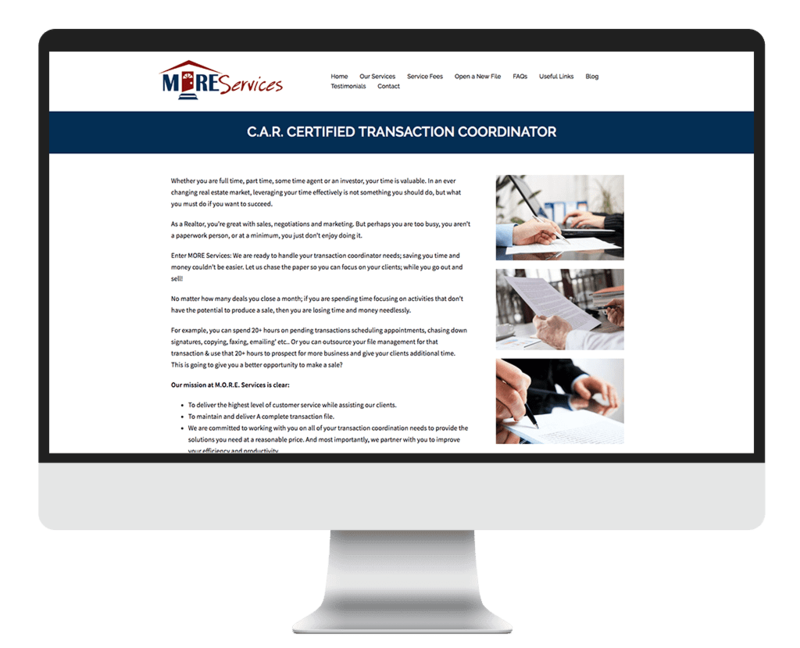 – We are committed to working with you on all of your transaction coordination needs to provide the solutions you need at a reasonable price. And most importantly, we partner with you to improve your efficiency and productivity, which ultimately increases your bottom line. After having viewed our site, please contact us with any questions, or suggestions of how we can serve you better. If for any reason you decide to choose someone else, we would like to know why you felt they offered you a better service.